With seven siblings and parents with limited means - her mother a laundress and father a freelance photographer - Moro Norhani T. Nassa (14) was a target highschool drop-out, until she became one of 194 Adopt-a-Student scholars. AAS is a program with individual local, national and international donors who financially support children in their tuition. Children’s Desk created this program in 2007 as response to the overwhelming number of families with no school means. Now it stands in addition to the support for barangay scholarships courtesy of the BCPCs. Picture Once timid and shy, AAS scholar Norhani boldly led the Muslim prayer in the Assembly of Partners 2012 attended by 73 individuals from NGOs, GOs, and business. When the Pantawid Pamilya or 4Ps began in 2011, the DSWD program by the Aquino administration for conditioned financial support education and health, Pasali released the AAS children entitled to 4P’s and transferred their scholarships to families beyond the program. 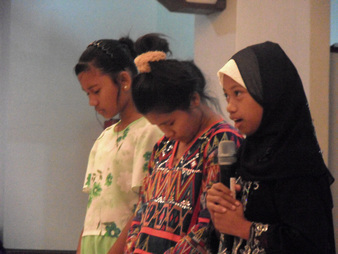 As Norhani is 14 and past the age designated for 4Ps, she remained AAS scholar. Other than tuition assistance, she also is a recipient of the school supplies provided by the Consortium for the Protection of Children and its Tulong Nyo Kinabukasan Ko initiative (Your help is my Future), with its members the Barangay councils Fatima, San Jose & Tambler, Philippine National Police, Helping Hands I, Radio Kabalikat communication and ABS-CBN TV network pooling local resources. A Father's Message from PASALI Philippines on Vimeo. Norhani’s experience with discrimination in the past made her hesitant and shy. This has changed. She now confidently leads at school and children’s activities. She gardens with her family and other Tri-people children at the Family Days at SUGa. At home she helps maintain their own backyard garden whose yields go to their own table and small neighborhood sales. Someday she says, she’ll become a teacher and teach those who need education the most.